On a recent business trip to Coeur d'Alene, Josh and I decided to meet afterward at some of Idaho's wineries. I'd done some research for the blog several months ago and I knew they were making wine in Idaho. It usually takes on one of two forms; folks are making Idaho wine, typically from the Snake River Valley, or they're sourcing fruit from Washington. In the second case, it's hard to blame them. A couple examples of wineries that are sourcing Washington fruit are Coeur d'Alene Cellars and Pend Oreille Winery. I contacted Coeur d'Alene Cellars owner and proprietor Kimber Gates and let her know that Josh and I would be in town and that we'd love to get a look at their wines. Kimber was happy to hear from us and we arranged a time to come around. When we arrived at the tasting room we were greeted by Hana-Lee, tasting room manager and Coeur d'Alene native. She explained a little about the retail operations between the tasting room facility and their downtown wine bar, Barrel Room #6. The tasting room is a newer, slick-looking facility on the outskirts of Coeur d'Alene about ten minutes from downtown. As we talked, Hana-Lee got us started with the two Viogniers that Coeur d'Alene Cellars makes, L'Artiste, named in honor of Sarah Gates, Kimber's mother (who does all the paintings on the label), and the other Viognier, named Viognier. The three of us concurred that of the two, we preferred L'Artiste, which was fermented in stainless and had excellent acidity and tons of bright fruit. While we were waiting for winemaker Warren Schutz to join us, Hana Lee explained that Coeur d'Alene Cellars released their first vintage in 2002. They only did two wines at the time. They’re a family operation owned by the Gates family, not of Microsoft, but of Idaho. Kimber is the operating partner and manager with her father, and her mother paints all the labels. The tasting room and winery facility opened in 2004. Hana Lee continued us down the 6 for 6 tastings that they do for tasting room guests. We moved to the 2007 Cloud Nine, which is mostly Syrah with some Viognier and Mouvedre in there, a very reasonably priced and smooth drinking wine. As Warren joined us, he explained that he came on board in 2004. Warren got his wine education at UC Davis and did some work in California as well as Washington before coming to Idaho. He was in Spokane when he got word from friends at Spokane winery Arbor Crest that Coeur d'Alene Cellars needed some assistance for crush. Warren went from 10 hours a week to the winemaker within a year. Nearly all of the sites were selected when Warren joined the group, but they have since expanded to other vineyards, such as Lonesome Springs, while moving away from a few others. They get the preponderance of their fruit from Horse Heaven Hills, specifically McKinley Springs. 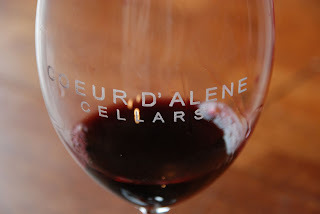 Warren credits that hot dry climate, known for being Washington's windiest AVA, for the concentration and intensity Coeur d'Alene Cellars can get in their wines, particularly their Syrah. As Warren has been able to get out to the sites more often, he’s become more in touch with the fruit, able to work with the growers and to figure in variability as Coeur d'Alene develops their style of wines. The next two wines we drank (both from 2006) were a testimony to that. The Envy was grown from some of the newer Syrah plantings at McKinley Springs, and resulted in a wine that was structured and masculine, with dark fruits and pepper. In contrast, the Opulence, from the older vines, demonstrated elegance and hints of the co-fermented Viognier, with a nose that also whispered it's new French oak influence. We left Coeur d'Alene Cellars impressed with the wines they’re producing. The Washington fruit, the commitment to making great wine, and their refusal to waiver from that commitment shows itself in the styles and seriousness of the wine they're making. 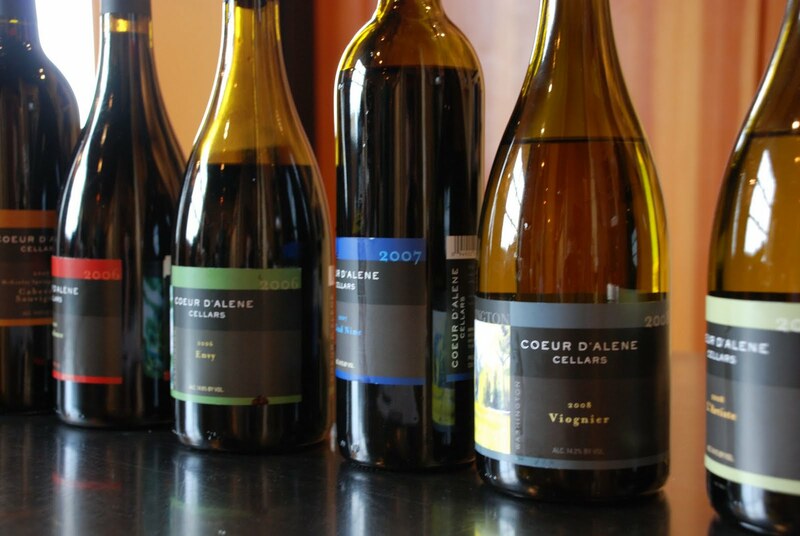 Located in a tourist location, it would be easy for Coeur d'Alene Cellars to put some plonk in a bottle and sell it to the the summer visitors in one of the NW's seasonal playgrounds. Instead they're making beautiful wines, particularly the Rhone style releases that speak to Washington terroir and commitment from Warren and Kimber. Our only regret was that we weren't in town while Barrel Room #6 was open to check out that operation.